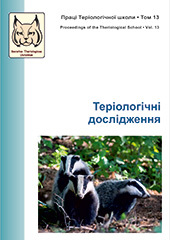 The volume deals with current research of mammals mainly of the fauna of Ukraine. In total, there are 21 contributions in this issue (19 articles and 2 reports about current workshops), grouped into 7 sections: Fauna and Systematics (3), Research on Rare Species (4), Species Dynamics (3), Mammalianl Ecology (4), Fauna Protection (2), History of Science (1), Chronicles (2), and Information (2). Among them, there is an exstended review on publications of the Ukrainian Theriological Society and analysis of the history of the Proceedings of the Theriological School. Since current issue, our magazine regularly publishes articles in English: in this volume, there are three such publications. Zagorodniuk, I. Geographical Variability of the Coat Coloration in the Weasel (Mustela nivalis) in Ukraine: Taxonomy or Climate?